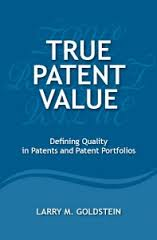 IP finance: Book Review: "True Patent Value"
Goldstein pursues his topic by distinguishing between "good" patents and "valuable" patents. As for the former, a patent is "good' if: (i) its claims "are well written" and (ii) "[t]he claims have 'good support' in the written description." A patent is "valuable" if: (i) "there is significant infringement by outside parties of the patent's claims", and (ii) "[n]o events have happened, external to the patent, which reduce or destroy the patent's value." The rest of the book elaborates on these points, devoting separate chapters to (i) patent basics; (ii) evaluating patents; (iii) court cases with good patents; (iv) ITC cases with good patents; (v) sales of patents; (vi) "essential" patents; and (vii) seminal patents. Goldstein is well qualified to opine on these topics. A graduate of Harvard College, the University of Chicago Law School and the Kellogg School of Management at Northwestern University, he is a registered U.S. patent attorney with a specialty in information and communication technologies. Of particular interest was his involvement in establishing the patent pool for 3G W-CDMA technology. An interesting aspect of the book is the author's declared intention that different chapters of the book are intended for different audiences. Thus Goldstein states which chapters of the book are of most interest and use for patent attorneys; engineers and entrepreneurs; corporate executives, directors and patent brokers; and investment bankers and others involved in the financial aspects of patents, respectively. In this reviewer's opinion, the first two groups will find the book of more direct interest, while the latter two groups will benefit from the insights that it provides on the question of patent quality, without necessarily delving into the fine points of patent law and practice. All would be well advised to read the book from cover to cover. Goldstein ends his book with a chapter containing 48 Q & As. While this form of summary is helpful in seeking to distill the main points of the book, it would have even more helpful to add a summary at the end of each chapter. Still, the Q&A format is a useful one. This book is a welcome change from the ("excessive", in this reviewer's opinion) attention being paid to the financial value of patents as a new form of asset class. Before there can be a dollars and cents valuation, the patent in question must meet the test of being either objectively "good" or "bad". Once this is ascertained, all of the parties active in the patent marketplace will be a better position to better assess the financial value of the patent at issue. Goldstein's book is an easily readable and a well-thought-out explanation of how the process of determining "good" and "bad" patents should take place. When I first entered the profession I was amazed to discover what a difference the quality of drafting makes to a patent application, and it's good to see that Goldstein recognises that in thinking about the value of the case. Clearly an unexamined patent application is much harder to evaluate than a patent, and that's an area where investors need a lot more help. Finally, a book on valuation that has its priorities right! One complaint I have had with books on valuation is that they gloss over, if not ignore, legal issues but in fact, legal considerations – particularly the strength of the IP - loom large in any valuation of IP. But what is the point of a financial valuation of a piece of IP if the IP can easily invalidated at the patent office or by a court?